This undated photo of Pigeon Hill is from local historian Charles Yates' collection. 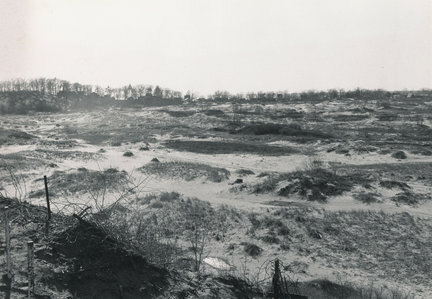 Thought to have been taken from the current site of the Muskegon Country Club, its shows the dune which some believed protected Muskegon from the full violence of Lake Michigan storms. A year after Nugent Sand Co. and the Pere Marquette Railroad first moved to begin mining operations at Pigeon Hill, the doomed fight to preserve the local landmark began. With a view to saving Pigeon Hill, not alone for its scenic beauty, but because of its commercial value as well, the directors of the Chamber of Commerce authorized the parks committee to proceed with a plan toward saving the hill Wednesday. Two plans were discussed, one of working up sentiment to have the city bonded for the amount to purchase the property and another to have a syndicate formed for the purpose of buying the land and later selling it to the city. The action taken by the directorate of the commerce board yesterday followed a move made three weeks ago, or two days after the city commission had granted the railroad right to extend its track to the hill. The directorate of the chamber at that time instructed its committee to start work to determine the amount of dune property involved and the proceedings that would be necessary to have the hill kept intact. The mining operations that removed Pigeon Hill, which once towered 217 feet above the western shores of Muskegon Lake, began in 1926. By 1938, the ancient dune was leveled. The only spot left higher than 10 feet above lake level were the port facilities, shown in this undated photo. 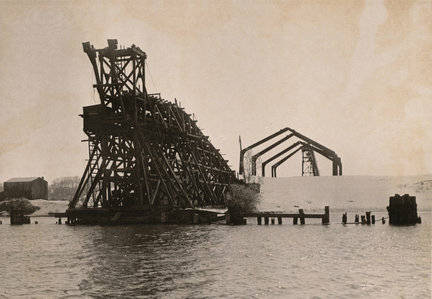 The dock and conveyors were razed in 1974. Pigeon Hill’s value to the city is inestimable, it was decided, but the question remains as to how to proceed. Floating of a bond issue to make the purchase of the hill possible and distribution of these bonds over a period of possibly 25 years would make the increase in taxes very small it is pointed out. On the other hand, the hill might be purchased by a syndicate and sold to the city at a time when the city sees fits to purchase it, it being understood that the purchase syndicate would not sell the sand. The hill belongs to Robert Ferguson, the Nugent Sand Company, and the Pere Marquette Railroad, and it is understood that the sand is to be sold and the ground to be developed as a home site after the sand has been removed. The city commission has granted permission to the railroad to extend its line to the hill and it is felt that if something is to be done it must be done immediately. Sentiment here is strong for the preservation of the hill, mainly because of its scenic beauty. Few people in town have expressed the sentiment that it is not worth thousands of dollars in bringing tourists here and in preserving the beauty of the lake front. Lakeside, it was declared by A.E. McCrea and Herman W. Freye, directors on the board of the chamber, is strongly in favor of the preservation of the great mound. Within two years, a legal technicality sealed the fate of Muskegon’s once-iconic landmark. Nugent Sand Co. needed rail access to the site to make mining the prehistoric dune profitable. The company got what it needed when the Michigan Supreme Court ruled that although the long-unused Pere Marquette Railroad spur along Beach Street was buried deep beneath the shifting sands, it was not abandoned as Beach Street residents contended. When reconstruction of the line began, Pigeon Hill was as doomed as its then-extinct namesake, the Passenger Pigeon. Despite a 1925 mining company proposal that it would build homes on the site and city attempts to turn the area into a park in the early 1960s, this 1977 photo shows how Pigeon Hill looked from the time mining operations ceased in the early 1950s until construction of Harbour Towne began in 1992. Sand from the Bluffton dune, which stood sentinel between Lake Michigan and Muskegon Lake, was sold to the foundries that made Muskegon prosperous. Although in later accounts the legendary hill’s height grew to upwards of 300 feet, it was precisely measured at 217 feet in 1907 by Muskegon High School’s trigonometry class. 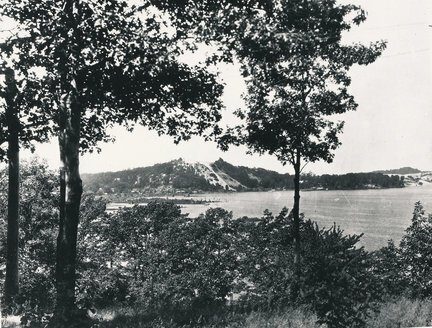 Local residents and civic organizations fought hard to save the dune, deposited there during the last ice age by an ancient ancestor of the Muskegon River. Adding their talents to the preservation effort were famed North Muskegon artist Victor Casenelli, who painted it, and beloved Muskegon poet Douglas Malloch, who wrote about it. Well-known Detroit newspaper columnist and radio announcer Curtis Custer Bradner spread word of the famed sand hill statewide. All efforts were in vain. Soon after the supreme court ruling in December 1926, trainloads of sand from Pigeon Hill began arriving at local foundries. Construction of port facilities for lake freighters were completed by mid-May in 1928 when the J.E. Savage sailed from the new dock at Devil’s Kitchen for Milwaukee with 7,000 tons of sand. Although mining operations would continue into the 1950s, by 1938 Pigeon Hill was reduced to a collection of sandy humps, none more than 10 feet high. The land lay vacant until construction began on Harbour Towne in 1992. Local grocer John Bennink’s words provide the most fitting epitaph for Muskegon’s lost legacy. During the battle to save the dune, Bennick told the city commission: “Pigeon Hill was placed there by God to protect this city. It saves us from storms that sweep in over the lake. If it is removed, the wrath of God will be upon us.